Posh star Marcus Maddison is tackled on the edge of the Southend penalty area. Photo: David Lowndes. Lord only knows where Peterborough United would be without Marcus Maddison. He’s the Rory McIlroy of this Posh team. The go-to guy in times of strife. The only dependable attacking force in a season, so far at least, of frustration and unfulfilled promise. Posh goalkeeper Luke McGee saves a oenalty from Southend's Anthony Wordsworth. Photo: David Lowndes. 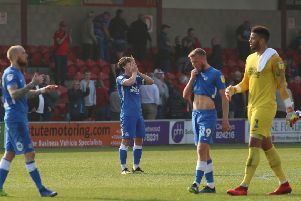 It’s one defeat in six League One games for the optimistic in the Posh camp, the place where manager Grant McCan resides. It’s no wins in six games in the eyes of the pessimists, most of whom can be found on social media performing their best impressions of the worst elements of American golf crowds. Maddison secured a fifth draw since victory was last tasted by Posh on August 27 with a terrific turn and strike from the edge of the penalty area in the 92nd minute. The ball hurried into the corner of the net to spark celebrations born more of relief than satisfaction. Make no mistake, teams with designs on promotion beat ordinary, ponderous teams like Southend, and indeed Shrewsbury, Walsall, Port Vale and Swindon, the others to have shared the spoils in the recent run. The late intervention also rescued Maddison from one those days when little went right on a personal level. Doing a ‘Lee Westwood’ in golf parlance. Maddison struck the crossbar deep into the first-half (he did well not to fall over in shock at receiving a pass from the enigmatic Paul Taylor), missed a one-on-one early in the second-half with a lame effort after latching onto Chris Forrester’s defence-splitting pass, conceded a penalty for handball (Posh ‘keeper Luke McGee saved the day again) and lost his man when Southend finally took the lead 13 minutes through Anthony Wordsworth, the man whose soft spot-kick had been saved. Some of Maddison’s on-field antics still irritate, but at least there is no sulking or hiding and he was rewarded after accepting substitute Nathan Oduwa’s short pass with his back to goal. Posh forward Paul Taylor shoots wide at Southend. Photo: David Lowndes. Defeat at Roots Hall would have hurt. The home side fielded quite possibly the most immobile back three in the division, were slow-witted and slow-moving in midfield and toothless in attack until substitutes Simon Cox and Marc-Antoine Fortune were send on 20 minutes from the end. Cox should have sealed the points when screwing badly wide with the goal at his mercy a couple of minutes before Maddison struck. Conversely Posh changes adversely affected their performance. Posh controlled most of the game without passing the ball half as well as normal and without creating anywhere near the number of scoring chances compared to recent matches, but when on-loan star George Moncur was introduced from the bench to replace striker Tom Nichols and Taylor was shoved further forward, Posh lost all momentum and started to invite home pressure. This is no reflection on Moncur whose speed of thought in tight, attacking areas should be more readily employed. Taylor’s performance was quite baffling. He found space behind Southend’s central midfield with ease. He took the ball under pressure and skipped past opponents on a regular basis and always left toiling defenders in his wake with his pace. But his tendancy to hang on to the ball for too long, to over-hit passes, or to shoot when he should pass make him a difficult team-mate. As one Twitter wag stated his ‘foreplay is oustanding, but it rarely leads to any satisfaction’. McCann’s comment after about poor decision-making can only have been aimed at one man, although replacement referee James Adcock’s ears must have been burning. There was little wrong with McGee’s decision-making as for the second match in a row he guessed right to save a spot-kick, one awarded correctly by Adcock, after Maddison had spoilt a committed piece of back-tracking by stopping a left-wing cross with an outstretched arm. Southend had offered little before then as they chased three home wins in a row, although Stephen McLaughlin’s looping header flicked the top of the crossbar four minutes before the interval. McGee’s only save of note was the penalty, while home ‘keeper Mark Oxley was similarly untroubled before thwarting Maddison’s poor effort when clean through without even diving. One feels for striker Nichols, the man whose position in the team demands he carries a lot of the blame for a sudden lack of goals. He makes intelligent runs and works hard, but he was battling three burly defenders on his own here and rarely received a pass with the necessary accuracy or pace to have a chance of scoring. It’s doubtful the 17 year-old forward option on the bench would fare any better. It’s a point chairman Darragh MacAnthony appeared to allude to after the game when suggesting new recruits would be sought. Posh: Luke McGee, Michael Smith (sub Nathan Oduwa, 86 mins), Andrew Hughes, Michael Bostwick, Jack Baldwin, Chris Forrester, Gwion Edwards, Leo Da Silva Lopes (sub Deon Moore, 81 mins), Marcus Maddison, Paul Taylor, Tom Nichols (sub George Moncur, 65 mins). Unused substitutes: Callum Chettle, Ricardo Santos, Hayden White, Mark Tyler. Southend: Mark Oxley, Jason Demetriou, Ben Coker, Adam Barrett, Anton Ferdinand, Ryan Innis, Anthony Wordsworth, Jermain McGlashan (sub Luke O’Neill, 88 mins), Marc Antione-Fortune, 70 mins), Ryan Leonard, David Mooney (sub Simon Cox, 69 mins). Unused substitutes: Ted Smith, John White, Adam Thompson, Will Atkinson. Southend - Wordsworth (77 mins). Cautions: Posh - Hughes (foul), Forrester (foul). Southend - Innis (dissent), Wordsworth (foul).